Often people ask: "I need a simple excel template to import sales data in Tally. Which one should I use?" udiMagic comes with several predefined Standard Excel templates. For Sales and Purchase excel formats, two different versions are provided viz BASIC and ADVANCED (with advanced features). To begin with, start with the BASIC template. If you requirements are NOT fulfilled with the BASIC template, then go for the ADVANCED template. If you face any problems, post your comments in the comments box below. 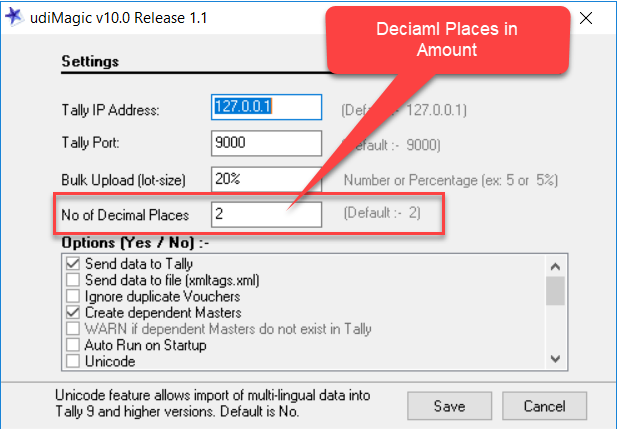 By default, the udiMagic Software supports two "Decimals Places in Amount". In simple words, when we import data from Excel to Tally ERP, the amount is rounded off to 2 decimals. However, in some countries (like Oman), the transactions are generally recorded with 3 decimals in amount. In addition, ensure that you specify the correct decimal places in the Excel sheet wherever the ROUND() function is used. In certain excel templates provided with udiMagic Software, the ROUND() function is used. You must change the ROUND() to specify the decimal places as per your requirement.